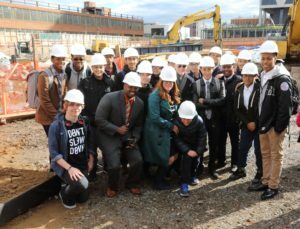 Developer Toby Moskovitz (front row, third from the left) with WHSAD students at the site of the 25 Kent Street project. My name is Patryk Pozarlik and I am a junior at WHSAD. I was afforded the opportunity to attend the ground breaking ceremony of the 25 Kent Street construction site. Along with site developer Toby Moskovitz, many of those involved gave speeches about the future benefits the new building will bring to Brooklyn. Everyone took photos as the VIP’s took the first scoop of the soil with a shovel, a tradition when an important groundbreaking event is undertaken. After the ceremony, my fellow students and I were invited to the new Williamsburg hotel for lunch and networking with some important people from the construction and architecture fields. Each of us were given a white hard hat with the 25 Kent logo on it to commemorate the event. To learn more about the 25 Kent Street project, please visit http://www.gensler.com/projects/25-kent.